Sometimes I have requests from couples to include something which is of particular significance to them in their wedding ceremony. As a Civil Registrar of Marriages I am not tied to using any ceremony, so apart from the three questions I must ask you by law, the wedding ceremony can be as colourful, cultural, or flamboyant as you wish. That being said, over the years I have accumulated many different ceremonies, so I normally have a good idea of what you might be looking for. Jewish couples would normally be married under a "chuppah" which represents a home. 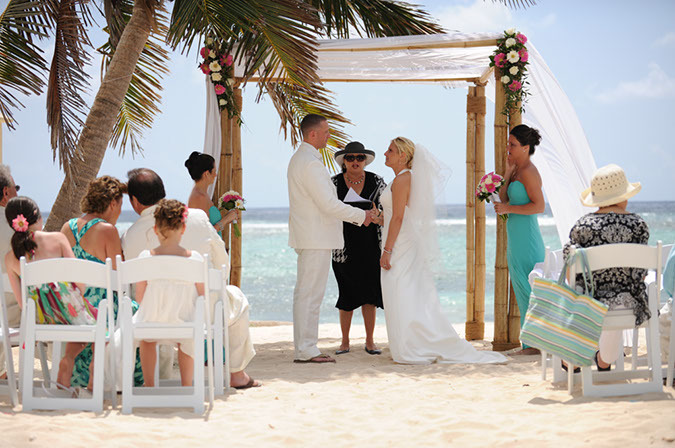 There are many styles of chuppah available in Cayman, most of them would have some type of fabric over the top representing a roof. Before the pronouncement, this bride circled her groom seven times as I read the seven blessings of a Jewish wedding ceremony. After the pronouncement the groom smashed a wine glass with his foot amid cheers of Maseltov! 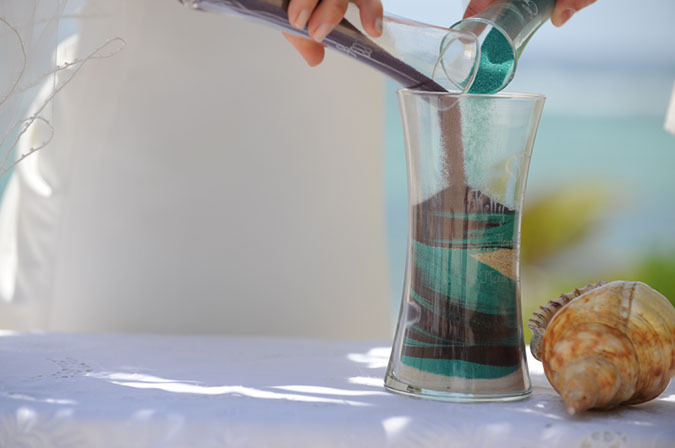 They also had a sand ceremony. Here are the mothers pouring the foundation of their Memory Vase. The ladies in waiting pose with the bride. I thought the choice of colours and choice of flowers was particularly appropriate. 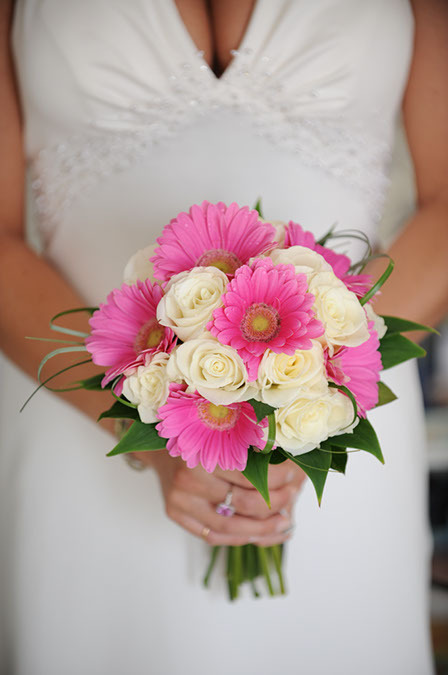 This was a stunning bouquet and I wanted to include it to give my upcoming brides ideas. Ceremony by Joy for Simply Weddings, florals by Celebrations, photography by Melissa of Better Angle Photography. This wedding p0hotographed at the Turtle Nest Inn, a boutique hotel in the beautiful and historic district of Bodden Town. Want to get away, and escape the madding crowd? 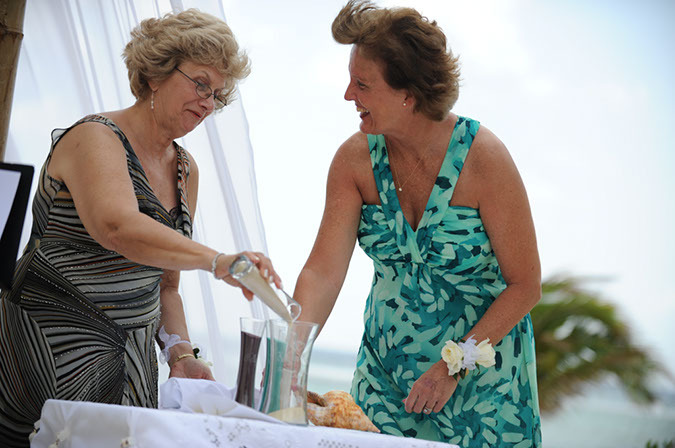 Call her email me to plan your own intimate beach wedding in the Cayman Islands (345)9269933 or (345)5256551 and email mywedding@candw.ky.